Whispers in the Loggia: For B16's Communications Day, A Call to Cyber-"Commitment"
For B16's Communications Day, A Call to Cyber-"Commitment"
Keeping with decades-long Vatican custom, this feast of St Francis de Sales – patron of writers and journalists – yet again brings the release of the papal message for World Communications Day, this year's focus on the theme Social Networks: portals of truth and faith; new spaces for evangelization. Tied into the Year of Faith, this year's message is just the latest edition of the Communications Day text to shirk attention to older forms of media in favor of the products of the digital revolution. Its theme always announced on late September's feast of the archangels, the WCD – the lone observance called for by the Fathers of Vatican II – will be marked on May 12th; the day always falls on the Sunday before Pentecost (now the transferred Ascension Day in most of the global church) as a link with Jesus' last command to "Go and teach all nations." Here, the English text of B16's message. As the 2013 World Communications Day draws near, I would like to offer you some reflections on an increasingly important reality regarding the way in which people today communicate among themselves. I wish to consider the development of digital social networks which are helping to create a new "agora", an open public square in which people share ideas, information and opinions, and in which new relationships and forms of community can come into being. The culture of social networks and the changes in the means and styles of communication pose demanding challenges to those who want to speak about truth and values. Often, as is also the case with other means of social communication, the significance and effectiveness of the various forms of expression appear to be determined more by their popularity than by their intrinsic importance and value. Popularity, for its part, is often linked to celebrity or to strategies of persuasion rather than to the logic of argumentation. At times the gentle voice of reason can be overwhelmed by the din of excessive information and it fails to attract attention which is given instead to those who express themselves in a more persuasive manner. The social media thus need the commitment of all who are conscious of the value of dialogue, reasoned debate and logical argumentation; of people who strive to cultivate forms of discourse and expression which appeal to the noblest aspirations of those engaged in the communication process. Dialogue and debate can also flourish and grow when we converse with and take seriously people whose ideas are different from our own. "Given the reality of cultural diversity, people need not only to accept the existence of the culture of others, but also to aspire to be enriched by it and to offer to it whatever they possess that is good, true and beautiful" (Address at the Meeting with the World of Culture, Bélem, Lisbon, 12 May 2010). In social networks, believers show their authenticity by sharing the profound source of their hope and joy: faith in the merciful and loving God revealed in Christ Jesus. This sharing consists not only in the explicit expression of their faith, but also in their witness, in the way in which they communicate "choices, preferences and judgements that are fully consistent with the Gospel, even when it is not spoken of specifically" (Message for the 2011 World Communications Day). A particularly significant way of offering such witness will be through a willingness to give oneself to others by patiently and respectfully engaging their questions and their doubts as they advance in their search for the truth and the meaning of human existence. The growing dialogue in social networks about faith and belief confirms the importance and relevance of religion in public debate and in the life of society. For those who have accepted the gift of faith with an open heart, the most radical response to mankind’s questions about love, truth and the meaning of life – questions certainly not absent from social networks – are found in the person of Jesus Christ. It is natural for those who have faith to desire to share it, respectfully and tactfully, with those they meet in the digital forum. Ultimately, however, if our efforts to share the Gospel bring forth good fruit, it is always because of the power of the word of God itself to touch hearts, prior to any of our own efforts. Trust in the power of God’s work must always be greater than any confidence we place in human means. In the digital environment, too, where it is easy for heated and divisive voices to be raised and where sensationalism can at times prevail, we are called to attentive discernment. Let us recall in this regard that Elijah recognized the voice of God not in the great and strong wind, not in the earthquake or the fire, but in "a still, small voice" (1 Kg 19:11-12). We need to trust in the fact that the basic human desire to love and to be loved, and to find meaning and truth – a desire which God himself has placed in the heart of every man and woman – keeps our contemporaries ever open to what Blessed Cardinal Newman called the "kindly light" of faith. 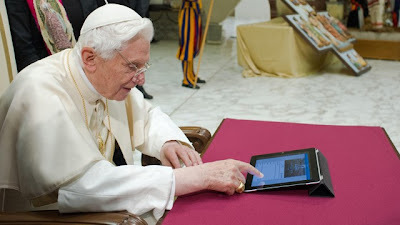 Social networks, as well as being a means of evangelization, can also be a factor in human development. As an example, in some geographical and cultural contexts where Christians feel isolated, social networks can reinforce their sense of real unity with the worldwide community of believers. The networks facilitate the sharing of spiritual and liturgical resources, helping people to pray with a greater sense of closeness to those who share the same faith. An authentic and interactive engagement with the questions and the doubts of those who are distant from the faith should make us feel the need to nourish, by prayer and reflection, our faith in the presence of God as well as our practical charity: "If I speak in the tongues of men and of angels, but have not love, I am a noisy gong or a clanging cymbal" (1 Cor 13:1). I pray that God’s Spirit will accompany you and enlighten you always, and I cordially impart my blessing to all of you, that you may be true heralds and witnesses of the Gospel. "Go into all the world and preach the Gospel to the whole creation" (Mk 16:15).